Aren’t popular search engines already safe? The short answer is: they are safe, for the most part. Search engines index hundreds of millions of websites, pages and documents on the Internet. The latest numbers show that there are at least 1.71 billion pages online. Popular search engines like Google, Bing and Yahoo do a pretty good job at identify dangerous results and removing them from their indexes and results pages. Because most desktop websites visits originate from search, search engines remain an important gateway to malware sites and users continue to be infected every year. How does SecureSearch protect me? Lavasoft SecureSearch integrates Website Safety Advisory. Website Safety Advisory lets you know if search results are safe or unsafe before you click on them. 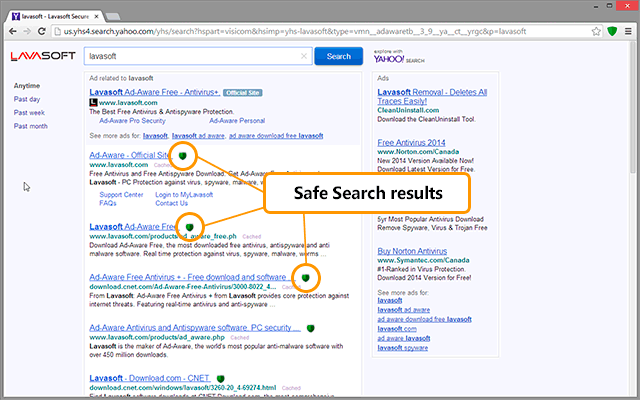 When using SecureSearch, you’ll notice that organic results on results pages are marked with either a green shield (safe) or red shield (unsafe). Always make sure to click on green shield links and be very careful if you see a red shield link. The Lavasoft SecureSearch is powered by three technology cores that were built to deliver safe and relevant results: Yahoo Search, Lavasoft Website Safety Advisory and Lavasoft Safe Browsing. SecureSearch is powered by Yahoo Search Results, which helps you find the most relevant information, video, images and answers from all across the Web. Lavasoft Malware Labs combine in real-time the latest dangerous URL and malware databases into one of the most extensive URL-centric malware, virus, adware and phishing resource in the security industry. This proprietary database powers Website Safety Advisory and lets you know if a website is safe or unsafe. If you inadvertently click on a dangerous link or visit a site known to host malware, then Lavasoft Safe Browsing will immediately protect you by redirecting you to an intermediary safe page that lets you know of the risks involved. Together, these core search and security components ensure that SecureSearch users benefit from relevant and safe search results. Do I still need an antivirus if I use SecureSearch? Even if Lavasoft SecureSearch protects you from visiting dangerous sites, it does not replace an antivirus. SecureSearch provides protection during your search experience, it does not monitor background processes nor does it analyze files on your computer. This is why it is strongly recommended to always use an antivirus along with Lavasoft SecureSearch. To download our Ad-Aware Free Antivirus+, click here.